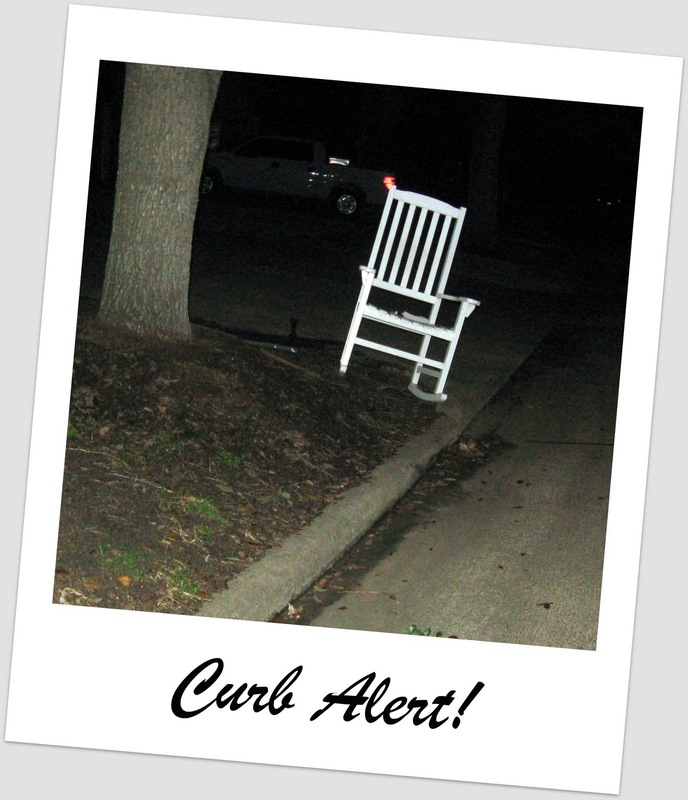 You are at:Home»Uncategorized»Curb Alert! Merry Christmas to Me Rug! I am as serious as Christmas folks! One night on my way to drop off LadyBug at a church event I passed by a few items on the curb! I could barely contain myself the entire way there! Bye LadyBug, hurry now get out of the car! After a quick glance, I realized it was completely wet and rotted on all of the legs and there were some major cracks in the backing. I snapped a quick picture and moved on! Oh well! 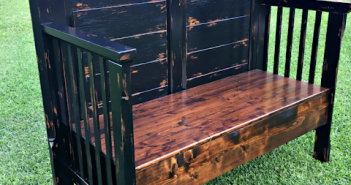 When it was time to pick LadyBug up a few hours later I was surprised again by what I saw – Pallets! 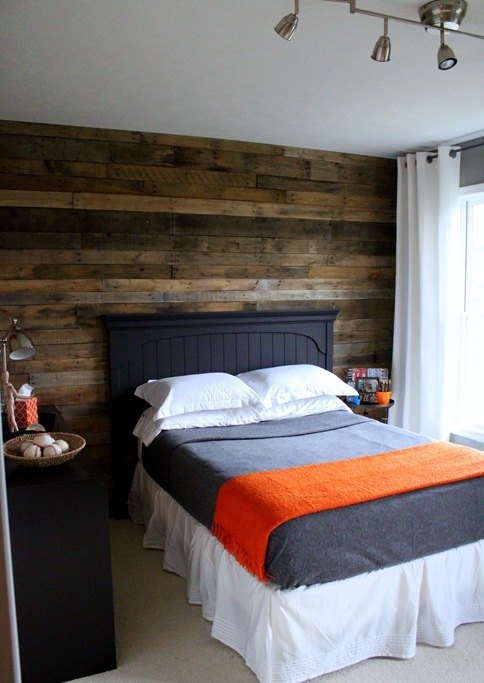 I would LOVE to do a pallet wall like Just a Girl‘s Tween Bedroom project, but don’t really have a place to store them and it would be difficult to convince My Love of the idea of transforming the entire wall! Ahhh, I love that room! I pulled over right away this time! These two pallets were in great shape and very clean so I shoved them in the back of my car as fast as I could. Thank goodness it was dark because they were big and heavy, one fell on me and I also got a few splinters in the process! 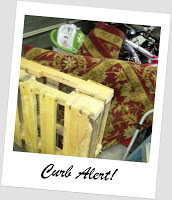 I should have used the advice from my Dumpster Diver’s Paradise post summing up a few good ideas from that silly blog! The gloves would have come in handy! I didn’t mention it to LadyBug but the moment she got into the car she said, “Mom, what did you get this time? It smells like fresh wood in here!” Ummm – Nothing Dear! she knows me too well! Anyway, I have a great idea for them and will try to tackle that project in the new year. 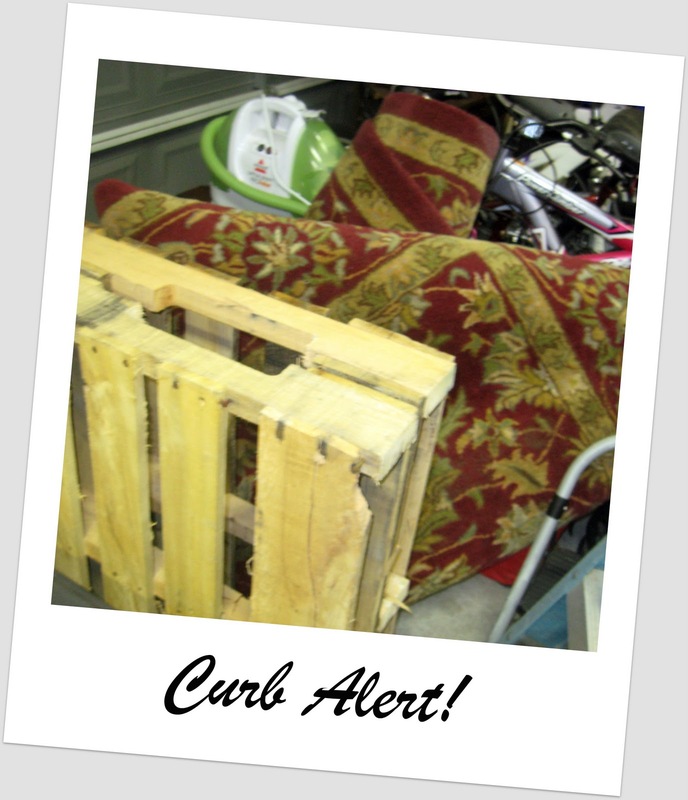 MOVING ON … do you see what’s next to the pallets? Yes, it’s a RUG! An 8×10 kinda rug! Awesomeness right there! I saw it on the way home so quickly dropped off LadyBug at the house and made up some kind of excuse to leave again, like a quick trip to the grocery store! ONE PROBLEM though, the back of my car is full with the two pallets! Being desperate to hurry I just decided to walk the block away from home and pray that I can lift the rug! Well I did it and thank goodness again that it was dark out (we are working on 9 pm now folks!) I lifted and dragged that heavy sucker home real fast and shoved it in my garage. I decided to deal with it all explain it to MyLove later in the week, there was just too much to do to get ready for Christmas! I could hardly sleep! 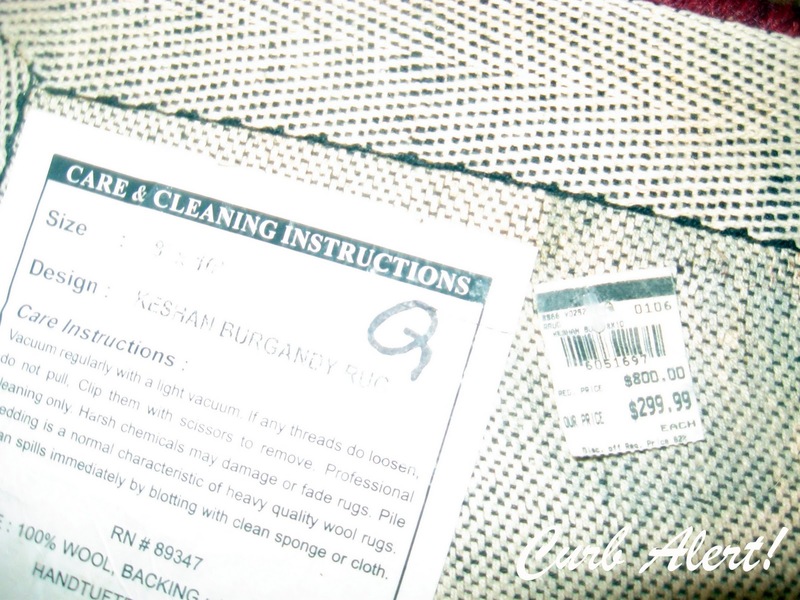 If you remember, I mentioned before that I gave away my previous rug on Freecycle. 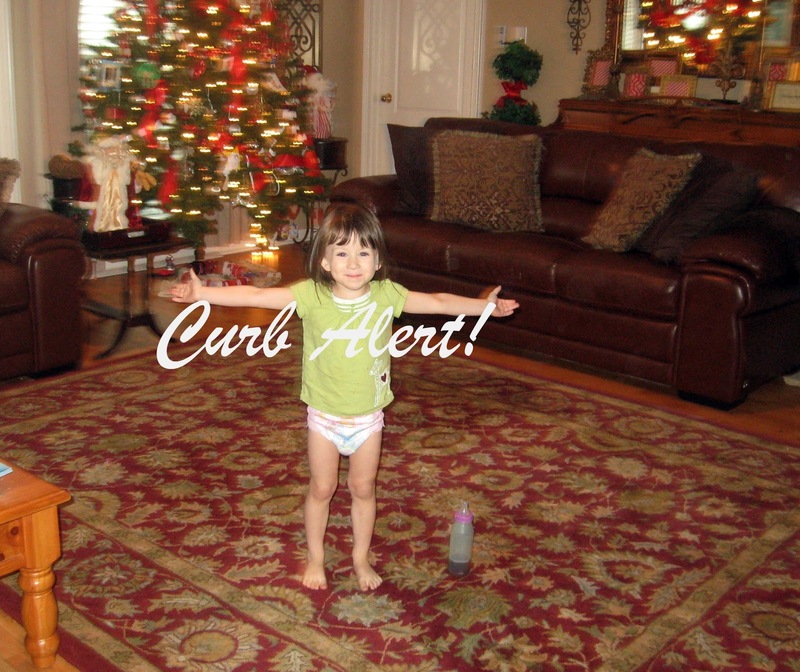 I loved that rug! But my daughter threw up on it and … long story about the cleaning process – I’ll spare you the details. I fully disclosed the info to the recipient and he wanted it anyway – ewww! 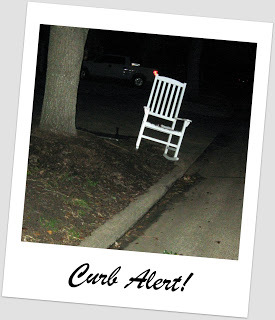 And here it is – my latest Curb Alert! Buttercup wanted to get in the picture so why not? “Tada” she says!. I really did not need to be fooling with it a few days before Christmas but I was so anxious to see it’s condition and check out how it looks in the room! It looked clean and had no smell thank goodness which was a super plus! 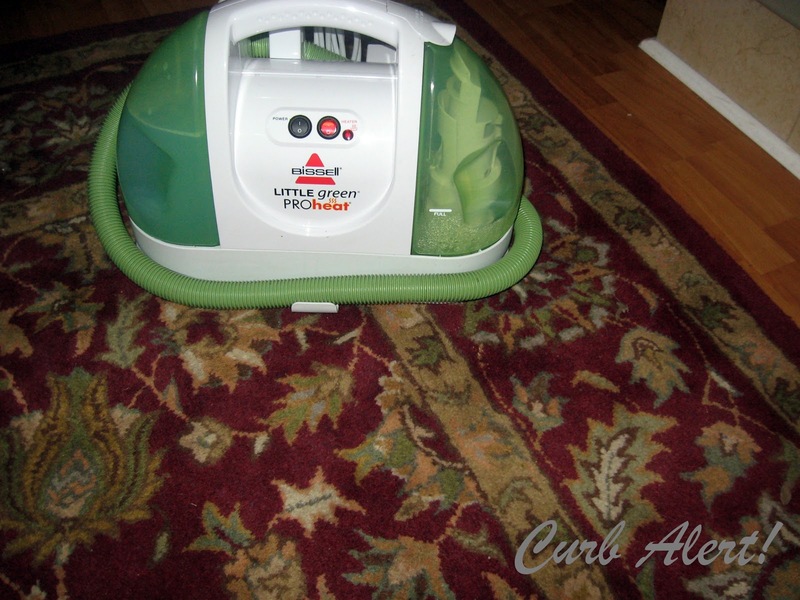 I got out the trusty Green Machine and got to work on my hands and knees to clean to entire rug, just in case it has cooties! HELLO! 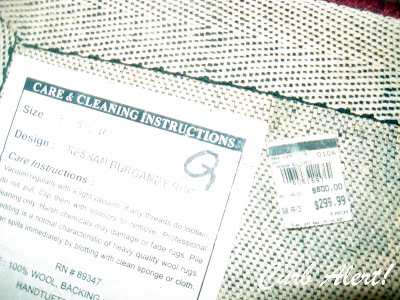 Does that tag say an $800 rug for $299!? Why YES it does! 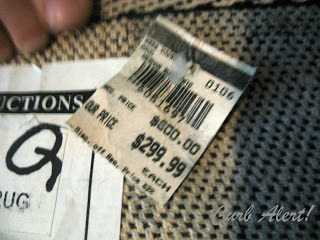 I recognize that tag and it’s from Tuesday Morning! Wowsers! 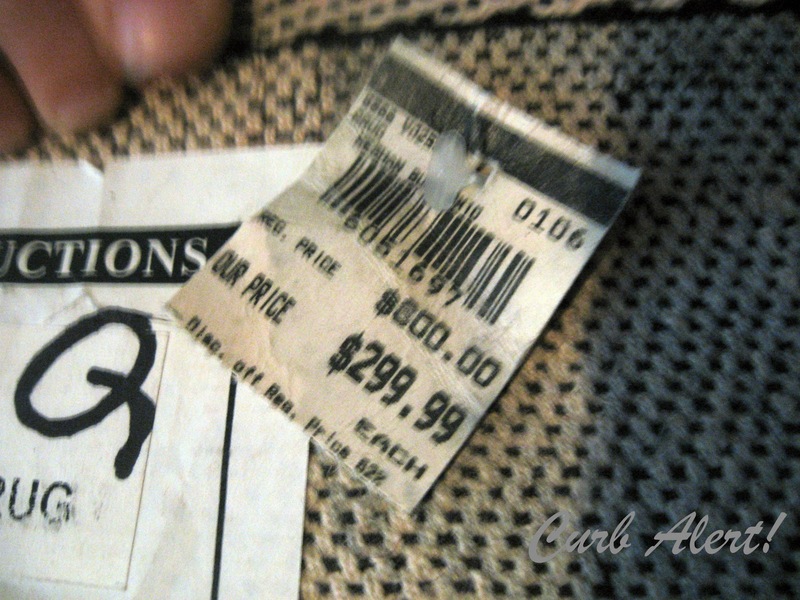 I try to stay out of that store for sake of my financial security and My Love’s financial sanity! And a close up just in case you didn’t see it clearly! And here it is now. 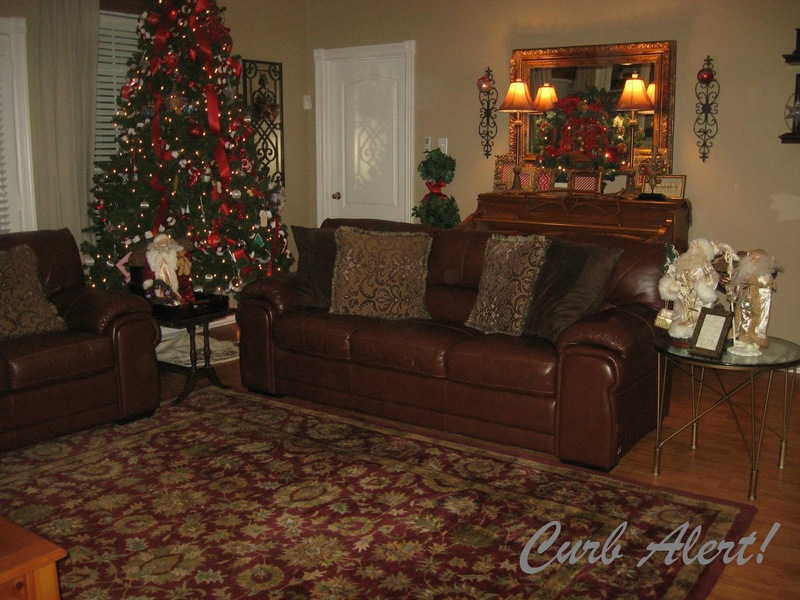 I cleaned up all of the Christmas stuff, moved the furniture around a bit and left it a little bare of decor…for now! 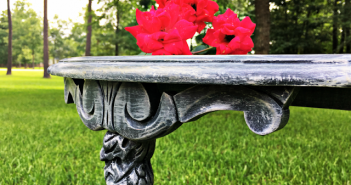 And the first thing Butterfly said when she saw it … “Wow Mom! 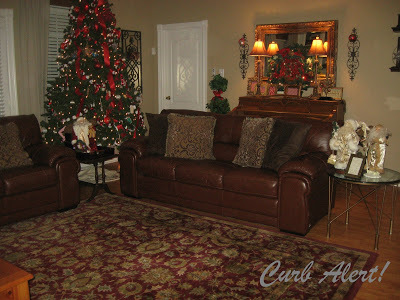 What and ugly rug!” Thanks babe, you can pick out our next rug when you can afford to pay for it! Sheesh! Kids these days! Doesn’t matter, it makes me happy! Yep! 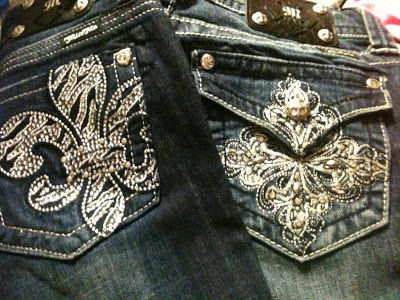 My favorite pair of jeans! – and only one size larger than Butterfly, my eldest decor-complaining daughter (begging to wear them) I might add! 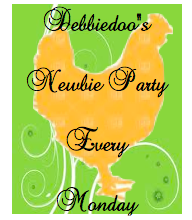 Check out Debbiedoo’s Newbie Party! You are really making a haul this week. Congrats on such great finds. You always seem to get lucky with curb side finds, I never see anything out during the winter, and I have my eyes peeled every time I go out, I guess I don't get out enough! I'm with ya. I've done my share of embarrassing curb surfing in the past week or 2 myself. Some 9:00ers even 🙂 We must all be made of the same stuff. Love that rug!! What do kids know? Soooper score on the rug!! And those jeans…!! What kind are those pretty things??? I found your blog over at your link up at FMFPTY's and just have to say you are awesome!! Love the finds! What an awesome find! Loving those jeans as welL! 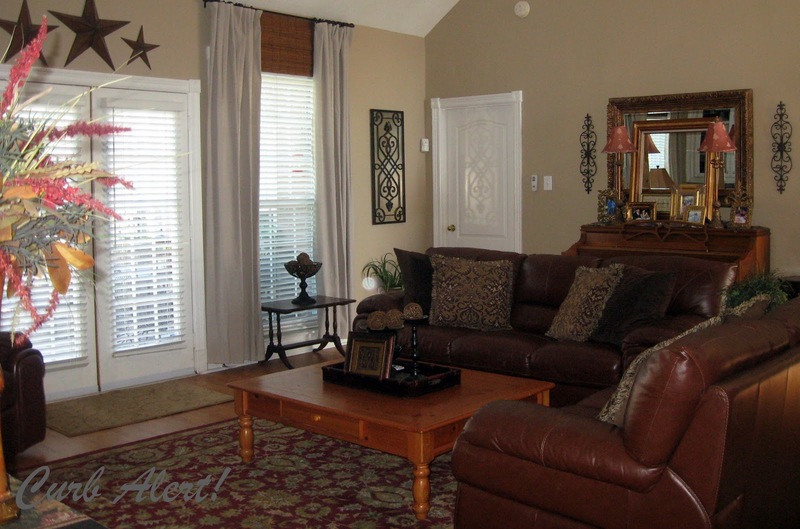 Tami, what awesome finds…especially the rug! I had a visual of you dragging this rug home…lol!! The things we do in the name of thrifting! Happy New Year!! Wow!!!! Okay, so do you live anywhere near me?? Because MAN I would have a blast with you!!!! haha. 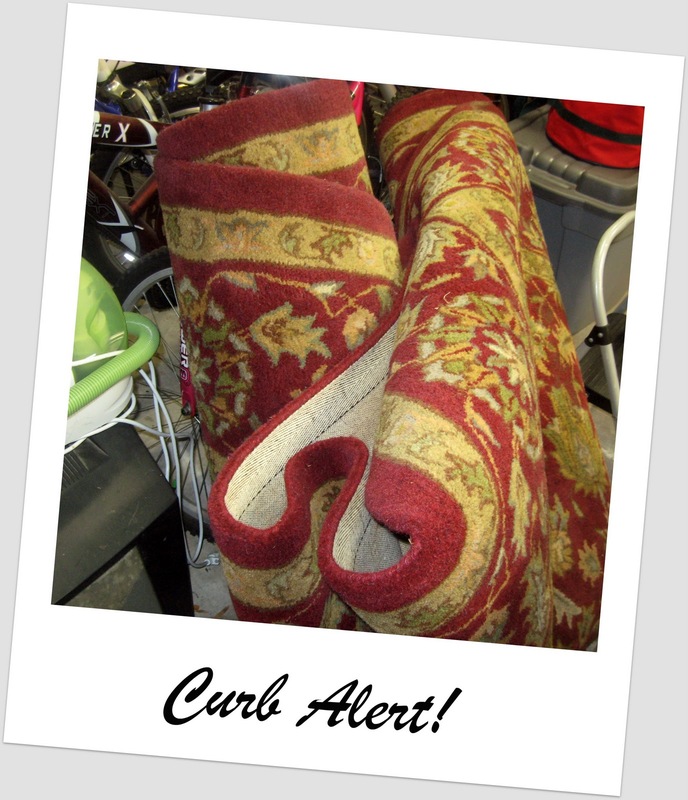 Curbside is so much better than thrift stores – it's FREE!!! Thankfully, my kids aren't old enough to be embarrassed yet… 🙂 Still can't believe someone tossed that rug!! I had to laugh at the thought of you dragging the rug home! We have this same rug, only 5×7, in my husbands office and I can tell you we paid more than $299 for it. Great finds!! You sure know how to score my friend. Thanks for sharing with my newbie party. I am cracking up! love your theme music! The rug is lovely, like one I paid about $400 for, years ago! 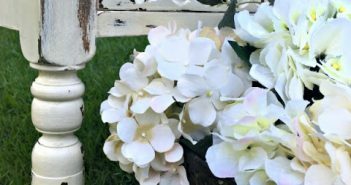 I 'm glad I found you on Debbiedoo's Newbie Party! You are so funny! I'm your newest follower, wishing you a Happy New Year of great finds and good blogging! Blessings!